Is your fine jewellery looking a little dull? Perhaps you have pieces that are lying broken in your drawer or that you’ve stopped wearing for fear that you will lose a diamond? Bring your jewellery to the experts at European Goldsmith where our on-site Master Goldsmith can help repair and restore your pieces at our Kelowna jewellery store. 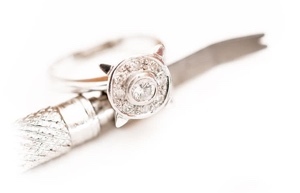 Fine jewellery needs to be maintained to help avoid costly repairs or losses. This includes regular cleaning and polishing, inspections, replating, and adjustments to prongs, clasps and weak points as necessary. With the right care and regular “check-ups”, your jewellery will last centuries and can become part of your family legacy. At European Goldsmith, your jewellery is repaired on site by co-owner and Master Goldsmith, John Berg. It is not shipped away to someone you cannot speak with and you run no risks in shipping your goods away and back again. We are also happy to show you your jewellery under a loupe or microscope before and after we take your jewellery in so that you can rest easy that you are leaving with the same piece, gemstones, and diamonds, that you came in with.